Abdominal wall hernia, also known as stomach hernia, can result from an abdominal organ pushing its way through a tear in the muscles of the abdomen. It is a fairly common condition, and as many as 10 percent of people can develop a hernia in their lifetime and more than 500,000 hernia operations occur yearly in the U.S. It is actually the most common procedure in the U.S. and can be easily performed using laparoscopy. A hernia can be painful and result in a lump – or outpouching – that sticks up from your abdomen, or it can be smaller, soft and without pain. The lump is caused by the organ that has pushed its way through a weak or thin spot in the abdomen – the bowel, the intestine, the bladder or even fatty tissues. People often attempt to push the hernia back in, unfortunately it only ends up recurring at a later date. If proper treatment is not pursued, the hernia can lose its blood supply and become strangulated, thus resulting in a medical emergency. You may already know someone who had a hernia, or have experienced one yourself. They can be quite painful if pressure to the abdomen increases from coughing or lifting, which can actually be the cause of the hernia as well. If you find a lump in your abdomen (or anywhere on your body) you should always consult your physician. Inguinal hernia – most common abdominal hernia. The inguinal canal is a small opening where the testicle descends during fetal development. Sometimes the opening does not properly close or leave a weak area where the hernia can develop later on. Femoral hernia – more common in women. Femoral hernias happen where the femoral vein and artery pass through the floor of the abdomen into the leg. Obturator hernia – least common pelvic floor hernia, most commonly in women. Obturator hernias happen in the obturator canal, where the obturator vein, artery and nerve connect the leg to the abdominal. Epigastric hernia – occur in infants. Epigastric hernias happen when the abdominal wall becomes weak between the belly button and breastbone – where the rectus muscles link together. Umbilical hernia – common in newborns. Happens in the belly button, where the umbilical cord was attached to the mother. Spigelian hernia – very rare. Spigelian hernias happen on the outer edges of rectus abdominal muscles. Incisional hernia – occur after abdominal surgery. Incisional hernias happen when the abdominal muscles have been cut open during surgery, creating a weak area where the hernia can push through. Hiatal hernias – These happen when the stomach pushes through the diaphragm opening where the esophagus goes from the chest to the abdomen. Sliding hiatal hernia – most common type of diaphragm hernia. Sliding hiatal hernias happen when the lower part of the esophagus and part of the stomach push through to the chest. Paraesophageal hernia – Happens when the stomach pushes into the chest with the esophagus and can result in a serious complication. Traumatic diaphragmatic hernia – occurs after major injury. Traumatic diaphragmatic hernias happen after a trauma, such as a gunshot or stab wound, tears or weakens the muscles, allowing abdominal muscles to slide into the chest cavity. Congenital diaphragmatic hernias – are very rare. Congenital diaphragmatic hernias happen when the diaphragm fails to form and close and can prevent the lungs from developing as well, especially if the organs move into the chest. Hernias are fairly common and can be caused by the list of factors mentioned above. Some do not display any symptoms, however, aside from the more common lump or bulge, hernias can also present with a number of symptoms. Here is a list of the common symptoms of abdominal wall hernias. More serious or complicated hernias can present additional symptoms that are more severe, such as chest pain. There is one main risk associated with abdominal wall hernias: strangulation. Strangulation is when the organ is cut off and loses blood. The severity of the strangulation depends on how long ago has the hernia developed and the size and location of the hernia. Some types of hernias, such as inguinal and femoral, are more prone to strangulation. Larger hernias that manage to push their way through small openings are also more likely to result in strangulation. There is also only one main complication associated with abdominal wall hernias: operative complications. Operative complications are the result of complications that arise during or after having the hernia removed. Generally, the complications are treatable and not long lasting. 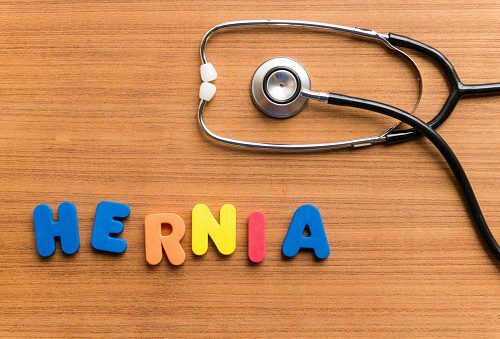 However, if a second hernia develops and is operated on, it increases the chances of further recurring hernias. Added complications from surgery are the urinary difficulties, infection, bruising of the scrotum (scrotal hematoma), fluid build-up in the scrotum (hydrocele formation) and, in very rare cases, testicular damage. While all hernias should be treated surgically, there are some patients who will not be able to have surgery. In that case, it is recommended that you lay on your back, gently push the hernia back in and then wear a truss – like spanks or other tight-fitting underwear – or surgical belt to help hold the hernia in. It is not a cure, but it can help. If you are unable to push the hernia in, that means it is caught in the abdominal wall and can result in strangulation, so you should seek medical attention immediately. If a hernia is small and isn’t growing or causing pain, your doctor might opt out of surgery. Surgery may also not be an option for those with certain medical conditions or if the hernia has a large opening and thus no risk of strangulation. Reduce strain – if you are constipated, be sure to add more fiber to your diet to prevent straining your abdominal muscles. Treat coughs – if you experience chronic coughing or sneezing, be sure to see your doctor about a treatment to keep you from coughing, which in turn makes your hernia bulge or swell. Avoid lifting – if you wish to remain active (which you absolutely should to avoid weight gain that also affects hernias), be sure to avoid any strenuous activity, especially the lifting of heavy objects. There is not much that can be done to prevent a hernia. When the abdominal wall becomes damaged or develops weak spots, a hernia commonly occurs. However, if you wish to lower the chances of developing hernia by reducing strain on your abdominal wall, there are a few lifestyle changes and techniques that can be helpful. Stop smoking or never start smoking. Now that you understand the symptoms and causes for abdominal wall hernias, you can better prevent or treat them should they occur. There are many different types , so be sure to speak with your doctor if you suspect one has developed. Hernias can be easy to cure and, as long as there are no complications, do not affect quality of life.